This simple lockout bracket is included on some actuator models to stop the coupler from moving or surging back when you back the trailer. The brake lockout bracket is used when you need to backover soft ground or up a hill. 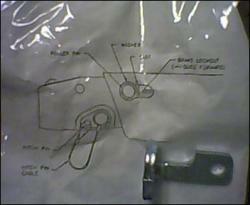 1 - Put or place the brake lockout into slot behind roller pin on the side of the actuator. 2 - Slide the brake lockout completely forward in slot. Washer will keep brake lockout from falling out while backing up. When you pull the trailer forward and the actuator extends, the brake lockout should fall out of the slot. This makes sure the actuator will function when stopping. NOTE: THE BRAKE LOCKOUT BRACKET MUST BE REMOVED BEFORE TOWING OR THE TRAILER BRAKES WILL NOT WORK.